A wide-ranging treatment of fundamental rotordynamics in order to serve engineers with the necessary knowledge to eliminate various vibration problems. Vibration Suppression - The chapter presents various methods and is a helpful guidance for professional engineers. Magnetic Bearings - The chapter provides fundamental knowledge and enables the reader to realize simple magnetic bearings in the laboratory. Some Practical Rotor Systems - The chapter explains various vibration characteristics of steam turbines and wind turbines. The contents of other chapters on Balancing, Vibrations due to Mechanical Elements, and Cracked Rotors are added to and revised extensively. The authors provide a classification of rotating shaft systems and general coverage of key ideas common to all branches of rotordynamics. They offers a unique analysis of dynamical problems, such as nonlinear rotordynamics, self-excited vibration, nonstationary vibration, and flow-induced oscillations. 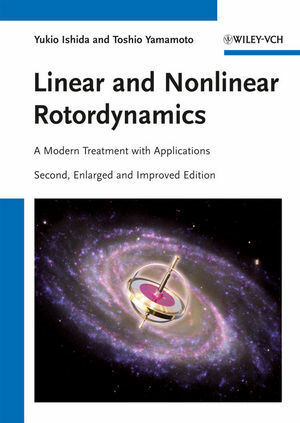 Nonlinear resonances are discussed in detail, as well as methods for shaft stability and various theoretical derivations and computational methods for analyzing rotors to determine and correct vibrations. This edition also includes case studies and problems. Toshio Yamamoto (1921-2007) was professor at Nagoya University. He was an internationally acknowledged expert for Rotor Dynamics and Nonlinear Vibrations. Professor Yamamoto published about 130 research papers and a number of books. For his academic achievements, he received one of the highests awards of the Japanese Society of Mechanical Engineering (JSME). Yukio Ishida (born 1948) is professor at Nagoya University. His main research fields are Rotor Dynamics, Nonlinear Dynamics and Vibration Suppressions. During his academic career, he received the Pioneer Award of the Japanese Society of Mechanical Engineering JSME (2001), the Nagai Scientific Foundation Award (2003), the JSME Medal for Outstanding Paper (2006), and the JSME Education Award (2006). Yukio Ishida is editor of the JSME Journal of System Design and Dynamics, and a long-time editor of the Journal of Vibration and Control. Professor Ishida has authored about 120 research papers and several books.